HOUSTON – The Trail Blazers closed their first road trip of the season with a 3-1 record by winning their second game in as many nights, a 104-85 victory over the Rockets at the Toyota Center on Tuesday night. Portland returns home for a six-game home stand with a 5-2 record, while Houston drops to just 1-5 on the young season. "“I thought we competed well," said Damian Lillard. "Each game, I thought something different had to happen for us to be in position to win. If you would’ve told me, we would’ve come away from this trip, 3-1, I’m sure everyone in here would’ve took it. I’m proud of the way we handled our first trip." In a wire-to-wire win, the Trail Blazers led by as many as 28 points in the third quarter. After Portland’s bench stole the show a night ago at Indiana, the usual suspects led the way in Houston. Jusuf Nurkic notched his third double-double of the season with 22 points and 10 rebounds, Damian Lillard recorded 22 points and seven assists, and CJ McCollum netted 19 points. The trio combined to shoot 22-for-33 from the floor. "Just make them make a decision. If they want to play like that, then we have to get the ball in our best players' hands and be aggressive and live with the results," said McCollum of Houston's switch-happy defense Tuesday night. "I think we did that. It was feast instead of famine tonight. 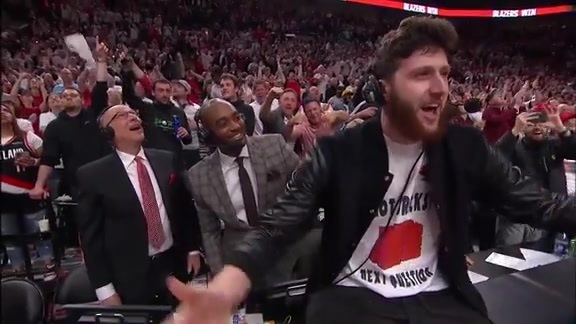 Nurk did a great job of finishing around the basket, we hit some jumpshots on switches, got to the basket a little bit and created some different things." The Trail Blazers held their opponent below 100 points for the second straight night. Houston managed to shoot just 32.3% from the field and made only 10 of its 43 3-point attempts (23.3%). Portland held Houston to just 15 points in the first quarter and 36 by halftime, the third-lowest scoring half by any NBA team so far this season. 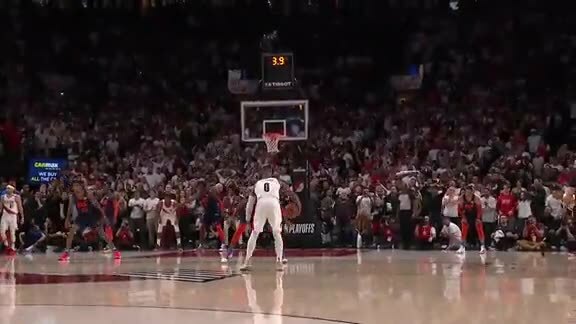 The Trail Blazers didn’t allow a single field goal for a 6:30 stretch bridging the first and second quarters. 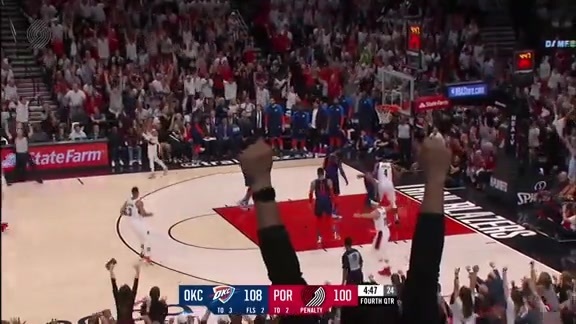 After scoring only 19 points of their own in the first quarter, Portland picked up its offense in the second stanza. The Trail Blazers tallied 32 points in the second quarter, with 25 combined from Lillard, McCollum and Nurkic. After posting a 51-36 halftime advantage, Portland never relinquished its double-digit lead. "Their switching gave us a lot of trouble early on, the first quarter and a half was kind of tough to watch," said Stotts. "We kept it simple — Dame made a lot of good reads, CJ made some good drives, we were able to get some separation at the end of the half just by playing isolation. It was necessarily pretty basketball but it was good to get a win." The starters then extended the lead to 23 points, 85-62, with one quarter to play. Lillard, McCollum and Nurkic remained on the bench for the final period as the rest of the team closed out the game. "If we can get our guys under 30 minutes, that's always a bonus," said Stotts. "You get a little nervous at the end. To get those guys rest when we can, especially on a back-to-back, that's good." Damian Lillard finished with 22 points on 8-of-10 shooting, seven assists, three rebounds and two steals in 27 minutes. Jusuf Nurkić also went for 22 points while grabbing 10 rebounds for the double-double in 24 minutes. CJ McCollum shot better than 50 percent from the field to finish with 19 points, four rebounds and two assists in 27 minutes. Nik Stauskas was the only other Trail Blazer to score in double figures with 10 points. The Rockets were led by Chris Paul, who went 6-of-19 from the field for 17 points to go with nine assists and five rebounds. Clint Capela put up a double-double as well with 14 points and 14 rebounds in 30 minutes. With their first road trip of the 2018-19 season in the books, the Trail Blazers return home to play their next six games at home starting Thursday night with a nationally-televised tilt against the New Orleans Pelicans. Tipoff is scheduled for 7:30 p.m.
Nurkic: "I knew we'd win if I showed up"